The PAM configuration file, pam.conf(4), is used to configure PAM service modules for system services, such as login, rlogin, su, and cron. The system administrator manages this file. An incorrect order of entries in pam.conf can cause unforeseen side effects. For example, a badly configured pam.conf can lock out users so that single-user mode becomes necessary for repair. For a description of setting the order, see How PAM Stacking Works. Name of the service, for example, ftp, login, or passwd. An application can use different service names for the services that the application provides. For example, the Oracle Solaris secure shell daemon uses these service names: sshd-none, sshd-password, sshd-kbdint, sshd-pubkey, and sshd-hostbased. The service-name other is a predefined name that is used as a wildcard service-name. If a particular service-name is not found in the configuration file, the configuration for other is used. The type of service, that is, auth, account, session, or password. Indicates the role of the module in determining the integrated success or failure value for the service. Valid control flags are binding, include, optional, required, requisite, and sufficient. See How PAM Stacking Works for information on the use of these flags. The path to the library object that implements the service. If the pathname is not absolute, the pathname is assumed to be relative to /usr/lib/security/$ISA/. Use the architecture-dependent macro $ISA to cause libpam to look in the directory for the particular architecture of the application. Options that are passed to the service modules. A module's man page describes the options that are accepted by that module. Typical module options include nowarn and debug. These entries represent a sample auth stack for the login service. To determine the outcome of this stack, the result codes of the individual modules require an integration process. In the integration process, the modules are executed in order as specified in /etc/pam.conf. 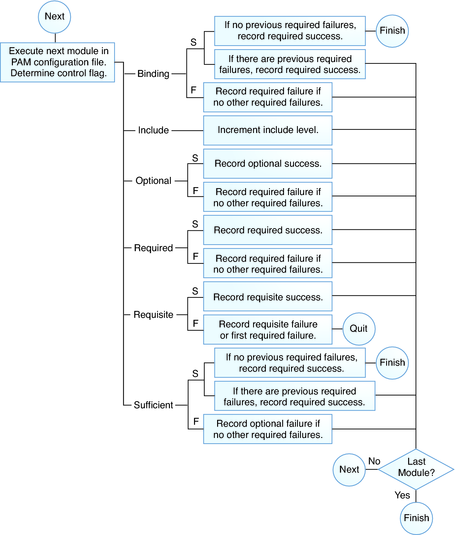 Each success or failure code is integrated in the overall result depending on the module's control flag. The control flag can cause early termination of the stack. For example, a requisite module might fail, or a sufficient or binding module might succeed. After the stack has been processed, the individual results are combined into a single, overall result that is delivered to the application. Binding – Success in meeting a binding module's requirements returns success immediately to the application if no previous required modules have failed. If these conditions are met, then no further execution of modules occurs. Failure causes a required failure to be recorded and the processing of modules to be continued. Include – Adds lines from a separate PAM configuration file to be used at this point in the PAM stack. This flag does not control success or failure behaviors. When a new file is read, the PAM include stack is incremented. When the stack check in the new file finishes, the include stack value is decremented. When the end of a file is reached and the PAM include stack is 0, then the stack processing ends. The maximum number for the PAM include stack is 32. Optional – Success in meeting an optional module's requirements is not necessary for using the service. Failure causes an optional failure to be recorded. Required – Success in meeting a required module's requirements is necessary for using the service. Failure results in an error return after the remaining modules for this service have been executed. Final success for the service is returned only if no binding or required modules have reported failures. Requisite – Success in meeting a requisite module's requirements is necessary for using the service. Failure results in an immediate error return with no further execution of modules. 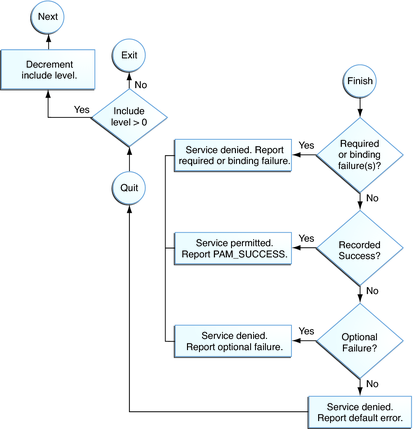 All requisite modules for a service must return success for the function to be able to return success to the application. Sufficient – If no previous required failures have occurred, success in a sufficient module returns success to the application immediately with no further execution of modules. Failure causes an optional failure to be recorded. The following two diagrams shows how access is determined in the integration process. The first diagram indicates how success or failure is recorded for each type of control flag. The second diagram shows how the integrated value is determined. Consider the following example of an rlogin service that requests authentication. When the rlogin service requests authentication, libpam first executes the pam_rhosts_auth(5) module. The control flag is set to sufficient for the pam_rhosts_auth module. If the pam_rhosts_auth module is able to authenticate the user, then processing stops and success is returned to the application. If the pam_rhosts_auth module fails to authenticate the user, then the next PAM module, pam_authtok_get(5) is executed. The control flag for this module is set to requisite. If pam_authtok_get fails, then the authentication process ends and the failure is returned to rlogin. If pam_authtok_get succeeds, then the next two modules, pam_dhkeys(5) and pam_unix_auth(5), are executed. Both modules have the associated control flags that are set to required so that the process continues regardless of whether an individual failure is returned. After pam_unix_auth is executed, no modules for rlogin authentication remain. At this point, if either pam_dhkeys or pam_unix_auth has returned a failure, the user is denied access through rlogin.